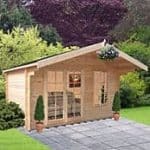 The 7’ x 7’ Shire Crinan Log Cabin is a fantastic example of how a compact size log cabin can suit the smaller garden without losing the aesthetics or practicality of a larger cabin. Charming features and a light-filled interior make this the ideal cabin from which to enjoy spending time in the garden. This charming 7’ x 7’ log cabin has plenty of features that help it become a central part of anyone’s garden furniture. One of the best features of the building is the roof, which is covered in heavy duty felt for protection against the rain. This makes for a building that has a high level of damp and rot protection.The roof is specially constructed from 12 mm tongue and groove, adding even more protection and sturdiness against the elements. That same tongue and groove design is present in the flooring too, so you have a tough and pleasant building to enjoy.The cabin will be delivered unpainted and in a natural timber, however, if you do wish to paint the log cabin to make it a feature or to match other pieces within your garden, that is certainly an option. 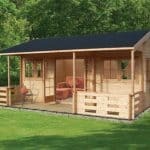 The Shire log cabin is ideal for the smaller garden, yet still offers all of the characteristics of a larger log cabin/summer house. 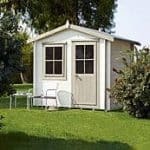 In this section we have a look at how this particular model may suit your garden lifestyle and the specific features it has to offer which make it stand out from the rest. Exterior: The Shire Crinan has a charming log cabin appearance; the 12mm tongue and groove timber cladding not only gives it a traditional feel but also provides protection and durability for the structure itself. 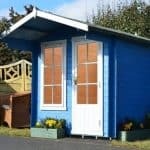 The cabin will be provided in a natural timber finish, however, as seen in the photograph, it may be painted as you wish to give it a more personalised and vibrant appearance. Interior: The 7’x7’ interior space is a good size for an occasional use garden building. Being multi-purpose, the space could be used from anything from an outdoor dining area to a relaxation spot or hobby room. The 7ft roof height allows even the tallest visitors to stand up comfortably whilst the cladded interior provides a warm and inviting environment from which to enjoy the garden. Windows & door: The compact nature of the building means that the cabin has just one window and door to the front aspect, however, together they let in enough light and offer adequate functionality for the size of building. The door is three-quarter glazed, whilst the large hinged window opens outwards to let fresh air and sounds of the garden circulate the interior. Security: The log cabin comes complete with a fully lockable door, giving you the peace of mind that both the building and any contents inside will be kept secure whilst not in use. 7’ x 7’ Shire Crinan Log Cabin: How easy to build? Assembly of the Shire Crinan is as straight-forward as can be thanks to the simple instructions with easy-to-follow diagrams, meaning that you will be enjoying the views from your new log cabin before you know it. The product will arrive at your door ready for self-assembly, in a package containing all of the timber panels, roofing, glazing, fixtures and fittings. It is recommended that two people assembly the cabin together for safety reasons due to the weight and size of the panels. We expect that the log cabin could be assembled within a day. Professional home installation is also available at an additional cost. 7’ x 7’ Shire Crinan Log Cabin: What is the overall quality like? 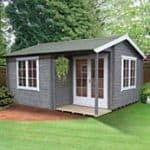 The Shire Crinan Log Cabin offers high quality construction with an exterior that is fully customisable to the customer’s needs. 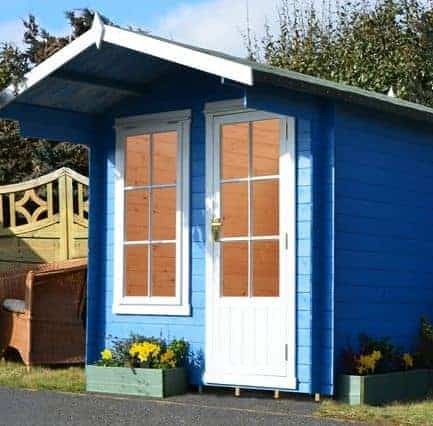 Supplied in a natural timber, the log cabin may be painted any colour you wish to match existing furniture or colour scheme within your garden. The 12mm tongue and groove cladding not only provides the cabin with a traditional feel, the interlocking timber boards also provide a protective layer against the elements all year round. The roof is constructed from solid sheet board and covered in heavy duty mineral felt which protects from water damage and weather conditions. A 10-year anti-rot guarantee is provided by the manufacturer, provided that the log cabin is well maintained throughout the years and a treatment is applied, both on assembly and annually thereafter. The charming 7’ x 7’ Shire Crinan Log Cabin allows even smaller gardens to enjoy the summer house experience. Measuring at the same size as the average garden shed, this compact size log cabin would fit neatly into a garden, whilst the natural timber enables it to blend into its natural surroundings. Whilst the price is on the higher side for the size of the product, you are ultimately paying for the charming features and quality construction which will see this log cabin standing in your garden for many years to come.